Leicester City’s fairytale Champions League journey came to an end at the King Power Stadium on Tuesday when they were held to a 1-1 draw by Atletico Madrid, who reached the semi-finals for the third time in four seasons with a 2-1 aggregate win.A first-half goal by Saul Niguez proved enough to ease the Spanish side through to the last four despite Leicester’s spirited revival in the second half when Jamie Vardy equalised on the night. Diego Simeone’s side, who won the first leg in Madrid 1-0, had the better of the opening exchanges, but after Leicester finally found their feet, Shinji Okazaki firing over from close range, Saul extended Atletico’s overall lead in the 26th minute, heading home powerfully from Filipe Luis’s superb cross.The Premier League champions, in their first Champions League campaign, responded strongly, dominating the second half, and England striker Vardy equalised on 61 minutes after Ben Chilwell’s shot was blocked, but it was not quite enough. Leicester defender Christian Fuchs spoke beforehand about the part the home crowd could play and the wall of noise that greeted kickoff would have shaken less battle-proven opposition than Simeone’s Atletico.The hosts were roared forward and had their first real sight of goal when Vardy reached the byline and his cutback looked perfect for Okazaki but his stumbling effort flew high over the crossbar.Atletico were calm and composed in possession and took the lead with a goal of devastating simplicity. Filipe Luis received the ball wide on the left and his perfect cross was met by a soaring Niguez and his downward header zipped off the turf and beyond the diving Kasper Schmeichel.Leicester’s already difficult task now took on Everest-like proportions as they were required to score three goals against a mean defence, who had leaked only four so far in the competition.Riyad Mahrez wasted one decent opportunity before halftime but fired straight at Jan Oblak from the edge of the area. Leicester lived dangerously at the back and Schmeichel did well to deny Yannick Carrasco before halftime.Craig Shakespeare sent Chilwell and Leonardo Ulloa on at halftime and Chilwell was soon in the thick of the action, shooting over the crossbar.At the other end Antoine Griezmann, scorer of the penalty which separated the sides in Madrid, had Leicester’s hearts in their mouths with a surging run into the area but his unselfish pull back was just in front of a tumbling Carrasco. With half an hour remaining Leicester’s lifeline arrived in the form of Vardy when the England striker calmly side-footed past Oblak after Chilwell’s shot flew across the area.Suddenly something extraordinary looked possible.For the first time in the tie Atletico were rattled and Vardy came close to putting Leicester ahead on the night when his goalbound shot in the 68th minute struck the back of Stefan Savic. 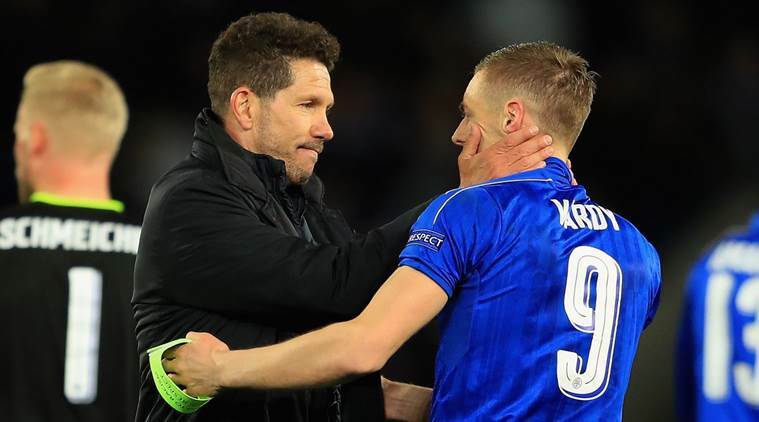 Atletico were now content to start counting down the minutes but Leicester refused to accept their journey was almost over.At times Simeone appeared to want to join the action on the pitch, such were his energy levels on the touchline, gesticulating wildly and imploring his players to stand firm.They did just that and as the minutes ticked away so did Leicester’s belief in another fairytale(THE INDIAN EXPRESS,2017).